On Monday, the President released his 2019 budget, which included devastating cuts to the Supplemental Nutritional Assistance Program (SNAP, formally known as food stamps). The plan aims to cut one of the nation’s most important safety net programs by nearly 30 percent, or $213 billion over 10 years. 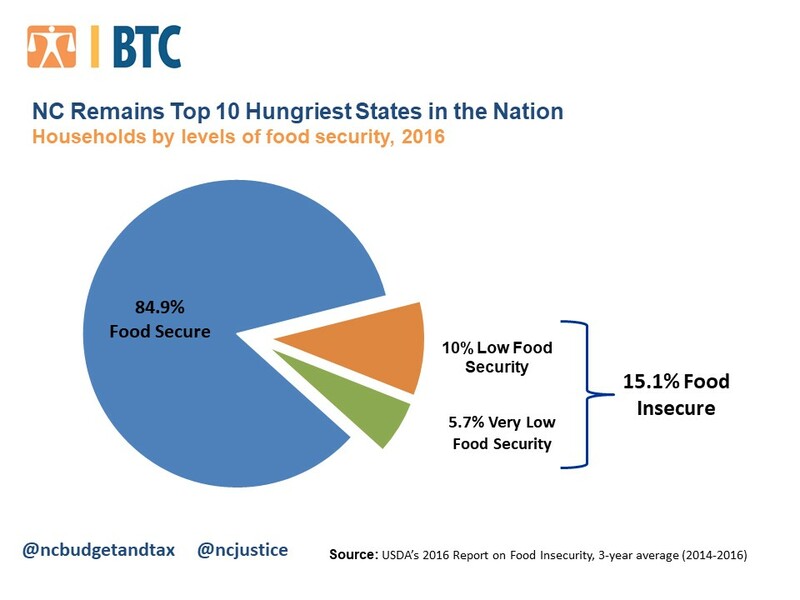 Although the cuts would have devastating effects nation-wide, the brunt of the cuts would be felt in states like North Carolina, which is the 10th hungriest in the nation and is where 1 in 6 residents receive SNAP. In order to reduce the SNAP caseload, the Trump administration proposes programmatic changes that would limit who could qualify for SNAP and what benefits they could receive. Right now, adults under 49 years of age without children are subject to a three-month time limit. This proposal would expand that limit to adults without children up to age 62. The plan would also get rid of categorical eligibility, a program which helps many low-income North Carolinians, especially those with children and high child care costs. Additionally, the proposal would punish families with more than six household members by capping benefits and would eliminate funding for SNAP-Ed, a program which helps educate on healthy eating choices. 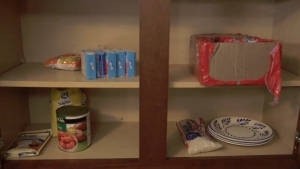 One of the most absurd proposals in the budget is a major provision which would replace SNAP benefits with a Soviet Union-era government-issued food box. Rather than automatically receiving benefits via an electronic benefit transfer (EBT) card, families that receive $90 or more in benefits a month (about 80 percent of participants nationally) would receive a “USDA Foods package” which would include “shelf-stable milk, ready to eat cereals, pasta, peanut butter, beans, and canned fruit and vegetables.” The plan would also rely on states to figure out how to package and deliver these boxes. There is more than one flaw with this concept. In 2016, SNAP served more than 1.5 million, or 1 in 6 North Carolinians who received an average household benefit of $241 a month. North Carolina does not have the infrastructure to buy, package, and deliver nearly a million packages each month. And even if that capacity somehow existed, it would hardly be more efficient than the current system in which benefits are automatically loaded on an EBT card. In addition to the logistical catastrophe that this plan creates, this would undo SNAP’s unique public-private partnership structure. Last year, more than 9,700 retailers participated in the SNAP program, pumping nearly $2.2 billion into the North Carolina economy. But there is another story here that is bigger than bad public policy. As if the proposed changes themselves were not bad enough, the rational for dramatic spending cuts is almost sinister. In December 2017, Congress passed a bill that included massive tax cuts that disproportionately benefited corporations and the wealthiest households at a price tag of $1.8 trillion. Members of Congress, including House Speaker Paul Ryan (R-Wis.), were clear that they would use cuts to the safety net to pay for the tax cuts. Often, “welfare reform” efforts such as this rely on inaccurate understandings of how the program works and who it serves. In North Carolina, more than 47 percent of SNAP participants are part of working families, nearly 70 percent are children, and almost 30 percent are in families with members who are elderly or disabled. Many of the proposed changes would punish low-income workers, making it even harder for them to place food on the table for the ones who depend on them. SNAP is also one of our nation’s most efficient anti-hunger programs. In 2014 (the last year data is available for all states), less than 3 percent of households received more benefits than they should have. Policy makers are choosing to chase ideological victories rather than doing what’s best for people. Instead of kicking people off to reduce the SNAP caseload, policy makers should ensure that workers can earn enough to place food on the table. We know what works and what builds a strong economy. Investing in people through education and training rather than punishing those who struggle is the only way to build a stronger North Carolina. Brian Kennedy II is a Public Policy Fellow with the Budget & Tax Center, a project of the North Carolina Justice Center.